Chocolate and vanilla join forces in these pretty, two-tone biscotti. 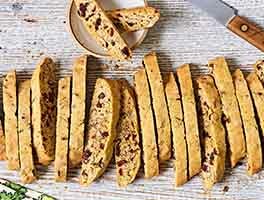 Drizzle baked biscotti with glaze for an elegant presentation; or simply press coarse sugar into the top prior to baking, for a crunchy/glittery look. Divide the dough in half, leaving half in the bowl, and placing half on the prepared pan. If you have a scale, half the dough is about 10 1/4 ounces (290g). Volume-wise, half the dough is a generous 1 cup. Shape the dough on the pan into a log that's about 14" long x 2 ½" wide. Straighten the log, and smooth its top and sides; a wet spatula or wet bowl scraper (or wet fingers) works well here. Place the pan in the freezer while you make the chocolate dough. To prepare the chocolate dough, add the cocoa powder and espresso to the vanilla dough in the bowl, stirring to combine. Stir in the chocolate chips. Remove the pan from the freezer. Using your wet fingers, spread the chocolate dough atop the vanilla dough, pressing it down the sides to entirely enclose the vanilla dough, if desired. You can also just leave the sides bare. Sprinkle the coarse sugar atop the dough, pressing it into the surface gently with your fingers. Bake the dough for 25 minutes. Remove it from the oven, and allow it to cool on the pan anywhere from 10 to 25 minutes; just work it into the schedule of whatever else you're doing in the kitchen. While the biscotti are cooling slightly, reduce the oven temperature to 325°F. If you've used parchment on your baking sheet, use it to lift the biscotti off the sheet onto a flat surface. 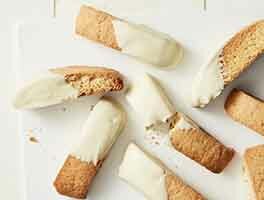 If you haven't used parchment, carefully lift the biscotti off the sheet onto a flat surface. Using a serrated knife or sharp chef's knife, cut the biscotti crosswise into 3/4" slices. Or cut the biscotti on the diagonal — for fewer, longer biscotti. As you're slicing, be sure to cut straight up and down, perpendicular to the pan; if you cut unevenly, biscotti may be thicker at the top than the bottom, and they'll topple over during their second bake. Set the biscotti, on edge, back on the baking sheet. Return the biscotti to the oven, and bake them for 30 to 40 minutes, till they feel very dry and are beginning to turn golden. They'll still feel a tiny bit moist in the very center, if you break off a piece; but they'll continue to dry out as they cool. If you haven't topped the biscotti with coarse sugar, glaze them once they're cool. 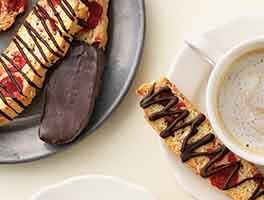 Mix the confectioners' sugar and water, and drizzle it atop the biscotti. Yield: 21 biscotti, about 4" to 5" long. Absolutely to die for! I crave them all the time so thank you so much!!! Lol. One thing I did was melt the milk chocolate to the other half in addition to the dark coco powder and espresso powder. This gave it a rich chocolate flavor and the contrast with the vanilla was heavenly. They remind me of old fashioned pinwheel cookies in flavor. I highly recommend this recipe to anyone. I prefer not to twice bake mine as I like these a little softer. Kind of bland. But it worked well for me. If I made it again I might put almonds in the vanilla layer and add cherries to the chocolate with almond extract added to the chocolate mixture. Followed the directions carefully. I am a seasoned baker. The chocolate layer was underdone when I went to cut the biscotti before the second bake. Hopefully they will cook enough during that to recover. The oven is beeping right now. I will check them out......Still not completely baked after 30 minutes at 325. I will give them a few more minutes. My other biscotti recipes always turn out as directed. Followed the recipe, but dissatisfied with the result. They were flavorless. If it weren't for the icing, there wouldn't be much to go with a cup of coffee. I baked this recipe to include with my Christmas goodies for a few "special" biscotti lovers and it is a keeper. It's delicious, something different, very pretty to look at. Will definitely make this again, and again. These were my first attempt at biscotti and they came out great! I made them for my twin sister and she was very impressed. Dough was easy to work with and the finished product looked like the picture. I sprinkled mine with the sparkling sugar and they were delicious. Excellent!! I doubled the recipe. While I work on chocolate part I, place the vanilla in the refrigerator. Before I place the dough on the parchment paper I pencil the correct measurement on the paper. You can still see the pencil mark after flipping over the paper. Using a little flour on the siltmat makes it very easy to shape it. Place it on the rectangle and shape to the correct measurement. Do the same for the chocolate then use a little water to smooth down and add on top of the vanilla layer. I use Maui Sugar to give it a great crunch. 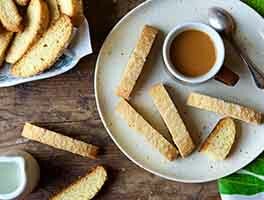 Everyone loves this recipe and says it's the best biscotti that they every had. My first time making Biscotti and this recipe was so simple and delicious! 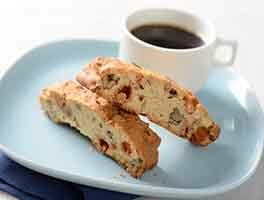 Biscotti were very easy and quick to make. Good flavor. Everyone who tried them liked them, but some folks were a little surprised by the slightly different texture of the chocolate portion (it was a bit softer). That didn't surprise me, but I was a bit surprised that it was commented on by more than one person. I would definitely make these again, but they're not my favorite. Most folks that i shared these with commented that the chocolate chip mandelbrot that I've made before (KAF recipe, of course!!) have better chocolate flavor. I tend to agree. But these were very good. 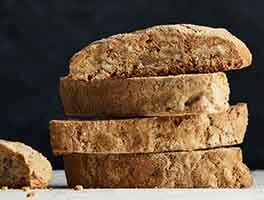 Question on biscotti - I make biscotti very often and have tried lots of different recipes, but have never seen a recipe for oatmeal raison biscotti. I have had a request from a friend to make oatmeal raisin - can you give me some direction on finding a recipe? Thanks! This is the recipe I get the most compliments on! They are pretty, and oh so good! Chocolate & vanilla! I even called to find out how to double the recipe because they are eaten very quickly.